Some big-name brick-and-mortar retailers have made the decision to stay closed on Thanksgiving Day, but that decision – nor all those Facebook pledges to not shop on the holiday – will make much of an impact on this year’s holiday season sales. It could be that consumers will just be shopping online, not in-store, as it turns out. According to recent forecasts, e-commerce sales are poised to hit record numbers in 2015, growing 11 percent over last year to reach $83 billion in sales. Consumers may be vowing to spend more time with family on Thanksgiving, instead of rushing out to hit early sales, but that doesn’t mean they won’t be shopping. According to Adobe’s 2015 holiday sales forecast, announced this week, Thanksgiving Day will see the fastest growth for the second consecutive year, growing 18 percent year-over-year to reach $1.6 billion in online sales. Black Friday will reach $1.7 billion. However, online, it’s Cyber Monday, not Black Friday, that still reigns supreme. This catch-up online shopping day where, historically, consumers picked up the items they weren’t able to snag in stores over the weekend, is expected to hit record numbers with $3 billion in sales – a 12 percent increase year-over-year. What’s interesting about this year’s predictions is that shoppers will be more narrowly focused on a smaller number of products – Adobe reports that 76 percent of 2015 holiday sales will go toward just 1 percent of product SKUs. At the top of that list are electronics, which account for over half of the 1 percent of SKUs, and gift cards, which are second with 10 percent. Adobe notes that over 55 million SKUs were analyzed to determine these figures, and that typically, 65 percent of spend during the year goes to 1 percent of SKUs. That number climbs during the holidays as consumers seek deals on top gifts. In addition, 2015 will be another breakout year for mobile shopping, as retailers have been moving to embrace the shift to small-screened devices with improvements to mobile websites, better checkout flows, integrations between desktop and mobile sites, and more. According to Adobe, mobile will drive the majority of online shopping visits (51 percent) for the first time in 2015 on Thanksgiving Day, where it will account to close to a third (29 percent) of sales – up 12 percent over last year. 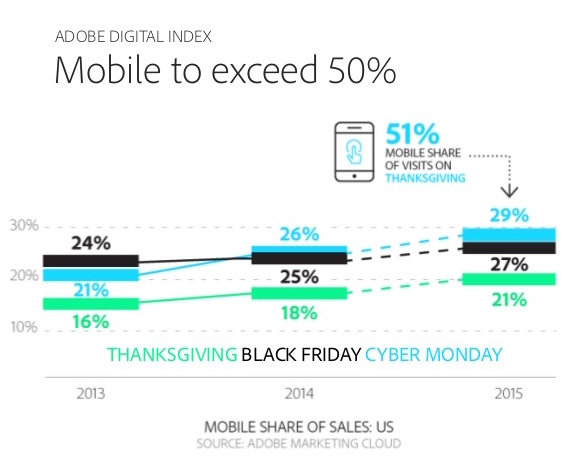 And mobile shopping will also replace desktop shopping on Black Friday and Cyber Monday, Adobe says. Christmas will exceed Thanksgiving in mobile share, though, accounting for 52 percent of visits and 30 percent of sales. Breaking mobile shopping down further, iOS users will drive 22 percent of sales to Android’s 7 percent. Apple Pay will generate 3 to 4 percent of sales revenue, when available, but overall, mobile wallet adoption is still low. Social media-driven sales, however, will stagnate, accounting for just 2 percent of referred visits. Facebook, of course, will lead here with the highest revenue per visit ($1.24) versus Pinterest’s $0.74, Twitter’s $0.60, and Reddit’s $0.57. But social media along with display ads will still help consumers find the best deals, with 14 percent of consumers discovering discounts via social media sites, and 23 percent finding discounts on display ads. Discounts and product availability, meanwhile, will help to influence the best time to buy. Says Adobe, prices are expected to drop before Thanksgiving while stock is still high. Thanksgiving Day will see the lowest overall pricing, with a 26 percent discount on average. Afterwards, out-of-stock incidents will increase by 83 percent then peak on Cyber Monday, where they’ll be up 116 percent. Thanksgiving and Cyber Monday may offer the lowest shipping costs, the forecast estimated. The buzz is helping grow demand for a number of this year’s top gifts, including top toy, Star Wars BB-8; Apple Watch for the top wearable; Apple TV as the top streaming device; PlayStation 4 as the number one in-demand game console; Minecraft and Halo 5 for the most talked-about game; Apple iPad as the top tablet; and Sony as the top high-end 4K TV. But social’s inability to convert visitors to buyers is bad news for companies experimenting with social commerce initiatives like the “buy” buttons on Facebook and Twitter, or Pinterest’s shoppable pins. 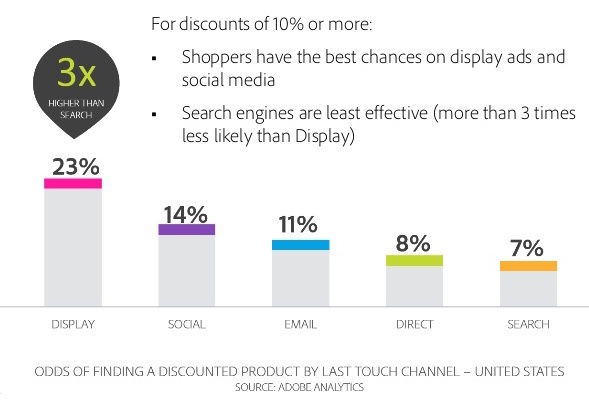 Users apparently don’t think to shop when on social sites, though they may be inspired or discover new products they buy later on.